Julian Construction (www.julianconstruction.com). a foundation repair and foundation construction company in Los Angeles, shares some information on how to tell if your home’s foundation is damaged. Sloping, or dipped floors, especially if the height difference is more than an inch over a distance of 15-20 feet. Cracks on exterior surfaces including stucco or brick. Uneven walls or floors. If you push a squared piece of furniture up flush against the wall, and notice a gap at the top or bottom edge, this can be a sign of floors that are not level or a damaged foundation. Drywall curving inward or outward. One indication is nails popping out of the wall, but you can also check with a vertical level. Gaps in the caulking around windows. “Sticky” doors and windows. A shift in the foundation can prevent them from opening and closing properly. Soft spots in the ground around your house. If you notice any of the issues mentioned above, you won’t necessarily have to replace your foundation. It is often possible to repair milder foundation damage, preventing further damage and leaving your home’s foundation stronger than before. 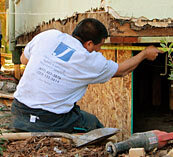 Find a local foundation contractor that specializes in foundation repair and replacement in your area.